Jason Tollefson, Sr. Product Marketing Manager, Microchip Technology Inc.
With the Internet of Things (IoT) becoming a reality, household appliances are well positioned to provide consumers control of their costs and time, and producers with new revenue and service models. Appliance designers can fit their products with sensors and displays to monitor their usage patterns, and provide timely service and exclusive buying opportunities. With the expected deployment of the IoT being an order of magnitude greater than that of smart phones, there will be tens of billions of “Things” that must be powered. 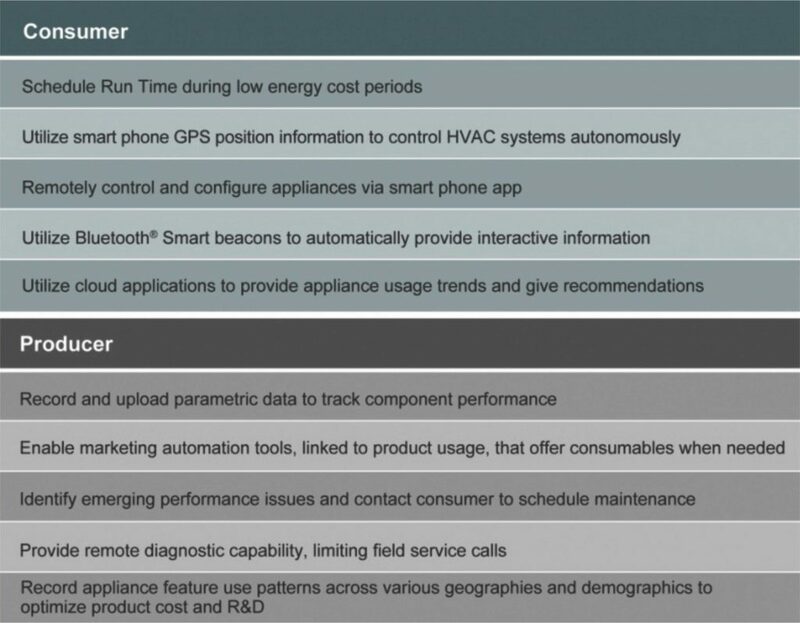 Appliance designers will want to reduce, or at least maintain, their present power-consumption levels—in order to meet governmental regulations, while adding IoT capabilities. To fulfill this need, extremely low power microcontrollers (MCUs) and Bluetooth Smart radios are required. They represent a flexible and cost effective way to connect objects at the edge of the IoT. Let’s explore these aspects of a low-power IoT system. There are many interpretations of the IoT, often depending on what portion of the market you serve, but a Wikipedia definition, as shown in Figure 1, does a good job of summarizing the concept. So, relating this definition to appliances, an IoT appliance would be uniquely identifiable, offer advanced connectivity, such as Bluetooth Smart or Wi-Fi, and connect to the existing Internet infrastructure. Connecting appliances to the Internet ushers in a new paradigm for both consumers and producers. For consumers, it offers them value in the ability to control cost and manage time. For producers, it offers value in the ability to monitor the performance of the appliance, proactively solve maintenance issues, and offer revenue-generation structures. The smart phone, low-power MCU and Bluetooth Smart radio offer appliance manufacturers the simplest way to add IoT capabilities in their products. Smart Phones now ship with integrated Bluetooth Smart, providing an instant gateway to the Internet, with the added benefit of simplified pairing to the appliance. A smartphone app can control the user experience and manage the data transfer to and from the appliance. Wi-Fi is another method to IoT-enable appliances that provides a constant channel to communicate sensor data, but pairing can be slightly more challenging. Bluetooth Smart offers beacon capability, vastly simplifying the pairing process. Beacons can advertise their presence to the smart phone when the two are in close proximity. Wi-Fi pairing, on the other hand, requires pushing a Wi-Fi Direct button on the router, which often resides in another room. The value of the appliance’s IoT connection is generated by low-power MCUs mated to a Bluetooth Smart radio. The MCU collects sensor data, such as power consumption or run hours, generated within the appliance and stores it in a usable format. When a smart phone connects with the appliance, the data are uploaded and either transmitted or displayed. The low-power MCU and radio also maintain compliance with governmental regulations by adding connectivity without measureable increases in power consumption. Seeing the simplicity of this system, let’s explore the components in detail. We’ll begin with Bluetooth. It’s very likely that you have used Bluetooth in some form for years. You may own a Bluetooth headset for your phone, and many cars have Bluetooth for audio streaming. But the Bluetooth we are interested in for IoT appliances is Bluetooth Smart. This is a new standard that is only recently available from the Bluetooth SIG. This new standard enables low-power operation, which is ideal for IoT applications. 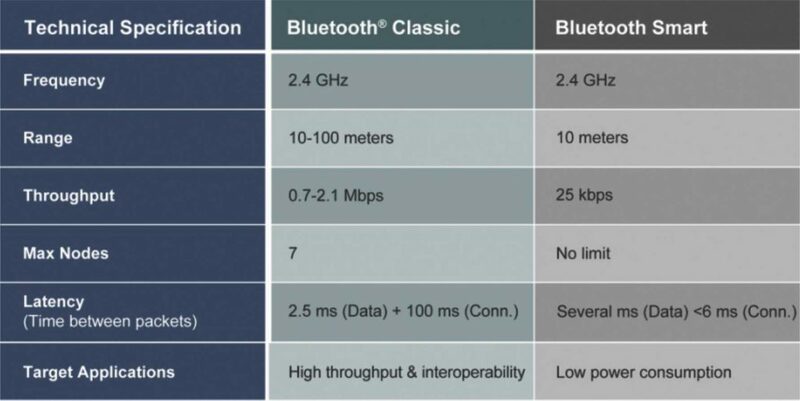 Table 2, shows that Bluetooth Classic offers longer range and throughput of 2.1 Mbps. 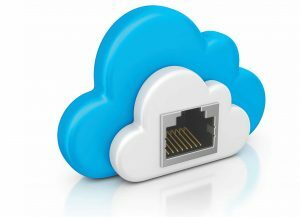 But for low-data-rate applications like IoT appliances, this rate is not required. Bluetooth Smart’s advantage is that it connects quickly, has throughput matching the need for IoT and offers lower power consumption. Bluetooth Smart was designed specifically for devices at the edge of the IoT. Recall the Wikipedia definition of an IoT device; it had to be uniquely identifiable. Well, Bluetooth Smart has that capability. For example, Figure2 portrays the organization of a Bluetooth Smart medical application. The hierarchy in the figure above shows the Bluetooth Blood Pressure Profile. This profile has services attributed to it, such as the device service and blood pressure service. 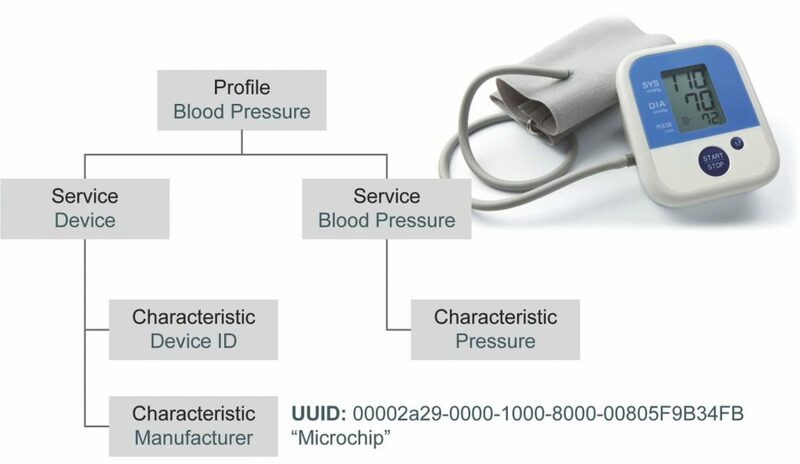 You can see that the profile includes UUID, uniquely identifiable information (in this example, the manufacturer), which is a requirement for IoT. This is just one example that is part of the Bluetooth Smart GATT or Generic Attribute Profiles. The profiles are typically supported in the Bluetooth device directly, as shown in Figure 3. There are profiles for many other applications, including a custom profile. The custom profile is ideal for appliances. In addition to uniquely identifiable attributes, what makes Bluetooth Smart radios ideal for IoT appliances is their power needs. The radio has the ability to stay paired with a smart phone without requiring a constant connection; and since connections require power, this saves energy. The Bluetooth radio features a “Connect Interval” and “Slave Latency,” which make this possible. 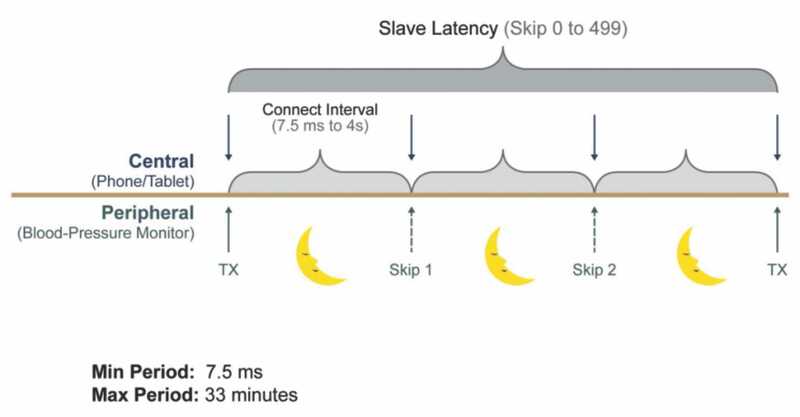 In Figure 4, you see that the Connect Interval is the time period between which the slave or “Peripheral” transmits to the Smart Phone or “Central,” before entering a low-power state. This time varies from a few milliseconds to several seconds, with the regularity of the connection determined by Slave Latency. These parameters, when combined, allow for data to be transmitted as frequently as every 7.5 milliseconds, or as infrequently as every 33 minutes for maximum energy savings. Of course the other half of the power equation is the MCU. Power consumption is largely determined by the power mode state and clock speed. Many new low-power MCUs include power modes. This is the ability to change the configuration of the MCU under software control. Typical examples are run, doze, idle, low-voltage sleep, and deep sleep. Each of these modes has key attributes that affect power. For example, the PIC MCU has doze and low-voltage sleep modes. In doze, the MCU can run code at a lower frequency than its on-chip peripherals. This reduces current consumption, but still allows key peripherals like a UART to communicate at the proper baud rate. Low-voltage sleep switches out the high-performance, on-chip regulator for a low-current regulator, allowing full MCU state retention using current of only hundreds of nano-Amps. A transition from run to low-voltage sleep reduces current consumption by 99.9%. Low-power MCUs also offer on-the-fly clock switching. This is the ability to change clock frequency based upon the task. If you are running math-intensive filter algorithms on sensor data, run at full clock speed. If in a simple loop and awaiting an interrupt, dial back clock speed to save current. Using these methods, current consumption is reduced from 5 milliamps to 26 micro-amps—a savings of 99%. The bottom line: low-power MCUs make it easy to save energy. Joining the edge of the IoT is quite achievable for a broad range of appliance designs. By using the built-in features of low-power MCUs and Bluetooth radios, it is now possible to create a connection to the IoT from an appliance that maintains regulatory energy compliance. This connection allows the collection, processing and transmission of data to smart phones in a way not possible just a few years ago. And with smart phones growing in popularity, they provide an instant gateway to value-creating applications. Consumers value this connectivity as it allows management of their busy lives from the one thing they always have near, their smart phone. Manufacturers benefit from product insights into performance and usage, allowing the utilization of modern marketing and service techniques to reduce lifetime costs and enhance revenue; and to gain insights for the development of next-gen appliances. The IoT is here, and it represents new opportunity, so step out there.